Back bends are delicious, forward bends are gracious, and twists are profoundly delightful. Ahh, the juiciness of spinal movement! The lusciousness of my words may have you thinking: why, if I speak of spinal motion in such delicious ways, do so many people have trouble with their spines while moving into forward bends, back bends and twists? Why is their experience of movement not juicy, but rather dry, parched or dying of thirst? This is a great question and one well worth exploring. The spine is a collection of vertebrae, each of which connects with fascia, blood vessels, muscles and nerves, which in turn, fan in various directions to nourish, stimulate and balance each part of the body. At its essence then, the spine is really a system of skeletal, neurological, electrical, vascular and chemical input that when balanced, creates magically fluid movement, much the same way that a well-balanced and connected orchestra creates awe-inspiring music. If you take a look at the spine from the side, you will notice that it is organized into four curves: the top curve relating to the neck (cervical curve), the next curve down relating to the rib cage (thoracic curve), the following curve relating to the lower back (lumbar curve), and the lowest curve relating to the sacrum/coccyx or area of the tailbone (sacral/coccygeal curve). These curves provide balance and fluidity of movement, much like a coiled spring that gives lightness by working as a shock absorber transferring and dissipating energy. If you take a look at the spine from the back, you will notice that the vertebrae are arranged smallest to largest, top to bottom. In fact, it looks a bit like a narrow pyramid - wide at the bottom and narrow at the top, giving the spine inherent stability. If you look at the spine again in another way, you will notice that each of the vertebrae are joined together as if they were pearls on a necklace, with each pearl having its own independent movement. So we come back to our earlier question, why are there such problems in the spine if the spine actually has these delightful characteristics enabling free, easy and juicy movement? Part of the problem rests in whether we use our “will” to move or whether we use relaxation to move. When we use our will, we increase tension in the body. When we increase tension in the body, movement becomes more difficult. 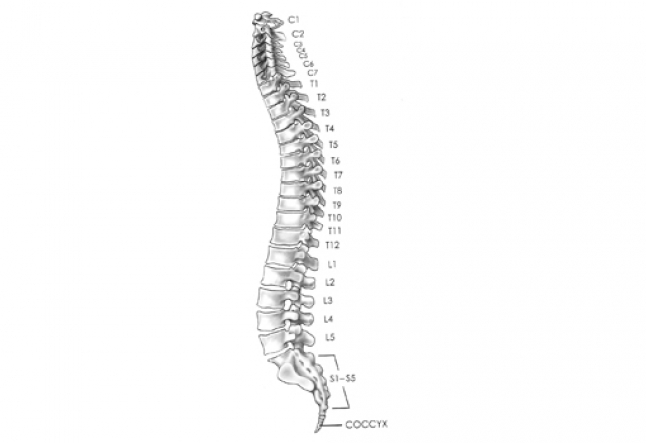 Within the spine, each vertebral joint has its own range of motion. Some vertebral joints, however, allow more movement than others. These more mobile joints are located at junctions where the spinal curves change direction. Our tendency as human beings is to move in these areas more than other areas. As a result, these junctions become even more hypermobile while other parts of the spine become tighter, which leads to an increased risk of injury. How does this relate to our yoga poses? In yoga, students have a tendency to flair out their lower ribs, jam through their lower back, or hinge at the lower neck. This is most noticeable in the lower back during back bends, in the neck during forward bends, and in the ribs during twists or when the body “bananas” during inversions. Yogis move this way because of habit, posture and previous athletic endeavors. As a result, other vertebral joints become tighter or stuck, for example, between the shoulder blades in the upper portion of the lower back. Ultimately then, in our yoga poses, we want to improve movement of the vertebrae that tend to become stuck. As these vertebrae move more easily, the more mobile areas of the spine no longer compensate for the tighter areas. Instead, they take on a role of giving freedom, inviting ease, and re-creating space - hence juiciness in the body. 1. When you are moving into your poses, or staying in one pose for a lengthy period of time, check to see if it is your will or your relaxation that is moving you. When moving with “will,” tension increases in the body, movement becomes more difficult, and there is an increased tendency to break the movement in the hypermobile links of the spine. 2. When you are moving into your backbend - are you overcompensating by moving more at the base of your lower spine because your shoulders and muscles of the rib cage are relatively much tighter? This often happens after a lot of computer use - the shoulder blades rise up to the ears and the shoulders round forward. Be sure to release these areas as a warm up before heading into back bends. 3. As you twist, are you leveraging with your arms because your spine doesn’t enable as much rotation? A way to check is to sit in an easy cross-legged position. Put your hands on your head, or shoulders and twist. How far do you get? Not as far if your arms were involved? Now allow your arms to leverage you a little - watch your breath, and move with relaxation.